While I'm washed up here, waiting to get back on the road again, hopefully soon, what better thing to post about than another interesting camper conversion project. I'm always interested in different ways to set up a camper for travel and living. So, here's another amazing 4WD warrior for you. 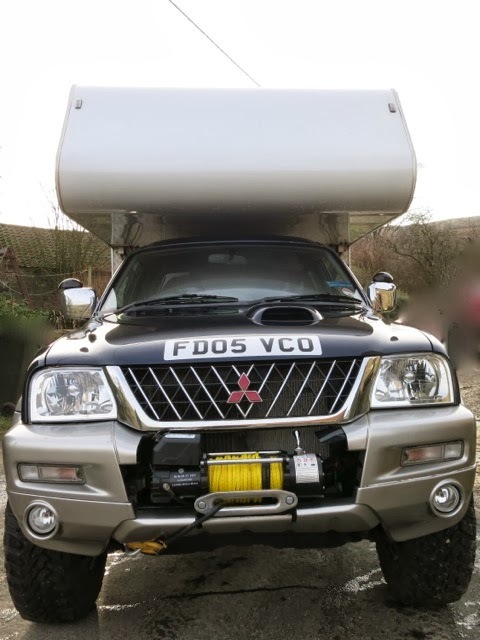 This Mitsubishi L200 pick-up has been modified for go anywhere off road camping, and overland expedition travel, and would be suitable for adventure anywhere in the world. The camping pod is a spacious demountable with a comfortable modern interior, which of course means you can use the pickup on its own as well. A few shots of the interior. (click to enlarge). A spacious and comfortable bed is situated above the cab, and has plenty of cupboard space around it for your clothes and personal belongings. There are also windows at the head and foot of the bed so you can see out from there. The wet bathroom has a toilet and shower - a skylight provides ample light. No shortage of storage in the demountable; the large wardrobe has a rail to hang all your clothes and outdoor jackets. The kitchen, not shown here in the photos has a sink, a 4 ring burner hob, grill & microwave all built in. There are high capacity water tanks fitted and all the pipes and hoses are internal for frost protection when travelling in cold climates. The entire demountable living pod has heavy duty insulation to keep you cool in the heat or keep you warm in the cold. It incorporates high BTU central heating system. This truck has a 4,000 watt inverter fitted that powers the microwave, lighting, electric heating, toaster, and the water can be heated by gas or electric. There is of course a full camp site hook up fitted as well. The inverter is purely for when you want electric in the wild. There's also a brand new heavy duty petrol generator onboard just in case. Its fitted with a 9 ton remote winch with plasma rope. The suspension is brand new all round and has 20% uprated rear springs and Pro Comp shocks. 16" steel wheels 32 degree offset so the overall track width has been widened by 8" without using wheel spacers. Tyres are 265x75x16 so just about 32.5 inches diameter from top to bottom. New oil, fuel & air filters. An uprated alternator with hi amp output. New cam belt and balancer shaft belt. New fan & power steering, aux belts. Brand new heavy duty radiator with double capacity for hot countries. The original belts and shocks that were taken off and replaced as precaution only have been kept for use as spares. Here's some footage of the L200 off-roading, including a few more interior shots including the kitchen as well, enjoy! Pretty impressive and capable vehicle, don't you think? 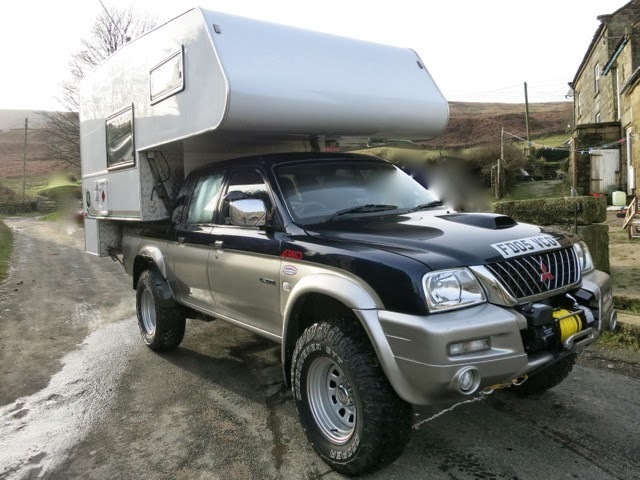 The owner of this L200 is considering selling it at the moment, so if you're interested get in touch and I'll give you his details. Offers in the region of £17,995.00 in case you're wondering. As for me, I can continue to dream of more adventures, and the day I'll get back on some of the dirt trails that surround me here in Portugal, then spend the night in a mountain forest, or wake up by a remote beach somewhere on the edge of Europe..
Is this intended for two persons?